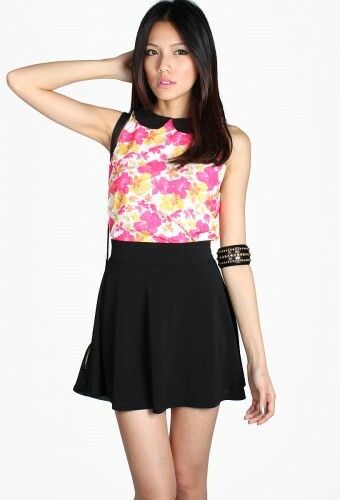 Usher in Spring 2013 with this charming floral crop top. This top features a contrasting peter pan collar and comes in spring's hottest pink hues. Beat the heat with a pair of high waisted denim cut offs and sandals. Made of woven polyester (non-stretchy). Features a cropped fit, contrasting peter pan collar and keyhole closure at back. Size S measures 16.5" pit to pit, 18.5" length. Size M measures 17.5" pit to pit, 19" length.